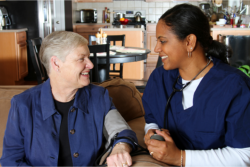 Active Angels In Home Health Care, LLC’s mission is to maintain and improve the quality of life for the people of the State of Missouri, (City of St. Louis, St. Louis and St. Charles Counties) by providing the best possible service to the public. Our Core Values are respect, responsiveness and accountability. At Active Angels In Home Health Care, LLC our employees embrace these values. Our Goal is to enable individuals and families to better fulfill their potential as well as promote, maintain, improve and protect the quality of life and quality of care of our clients. We want to ensure that our special needs clients may live as independently as possible with dignity and respect. Different doesn’t always mean that it’s better. But at Active Angels In Home Health Care, LLC, different IS better. Our home health agency is different from every other care provider in the industry because of our dedication to provide exceptional care services. We never stop at mediocrity – we are in pursuit of excellence. This dedication is present in every member of our staff. They embody the mission of Active Angels In Home Health Care, LLC to bring reliable health care to those who need it most. Whoever you will ask, they will most likely answer the same – Living at home is undoubtedly a preferred choice for clients. This is especially true during a time of illness or when recovering from injury. Because our health conditions during such times are in fragile states, we want to be in a place that is comfortable and familiar thus speeding up our recovery and making us more receptive to treatment. Active Angels In Home Health Care, LLC makes the option of staying at home available to those who are struggling with complex health challenges. We take care of clients who are injured, ailing and elderly clients who are transitioning into their golden years. At Active Angels In Home Health Care, LLC, we empower our clients to take charge of their health. Their preferences, concerns and care requirements are taken into consideration during the development of a care plan. If you would like to have a care plan specially designed for your home health care needs, please contact us.